On a recent visit to say hello to ELise and Tucker at Cedar Rock Gardens they were hard at work planting a humongous field of tulips, planned to bloom for next Mother’s Day. Elise generously shared pots of fresh marigolds dug from their fields, not in good enough shape to sell, but perfect for our first ever Day of the Dead altar, Ofrenda de Muertos. The vibrant colors and fresh citrusy scent of marigolds lure the spirits–marigolds are strewn about and placed around the altar so the souls can find their way. 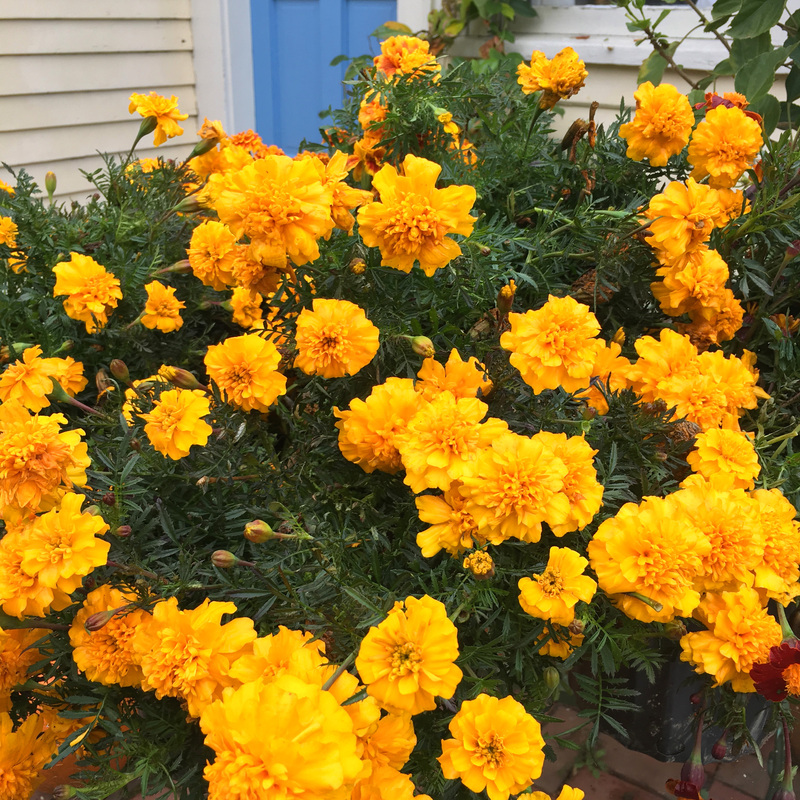 There is a wild version of marigolds that blooms in October and the Spanish name for the flower is flor de muerto, or flower of death. 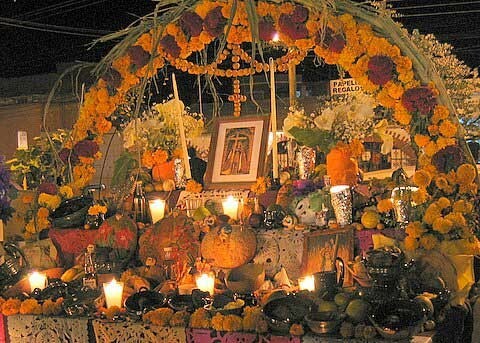 The altar, or “offering to the dead,” is a sacred Mexican tradition where those who have passed away are honored by the living. The celebration takes place on November 1st and 2nd, on the 1st to honor the souls of children and on the 2nd, to honor adults. 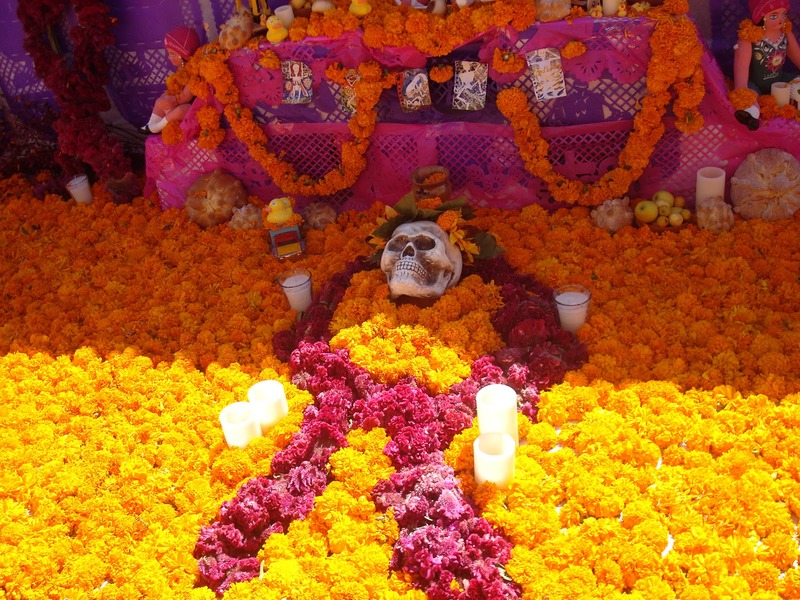 I became fascinated with the tradition after learning that Monarchs arrive in Mexico about the same time as Dia de los Muertos is celebrated. In Mexican folklore, butterflies represent the returning souls of departed loved ones. In the native language of the Purépecha, the name for the Monarch is the “harvester” butterfly. The Purépecha are a group of indigenous people centered in the northwestern region of the Mexican state of Michoacán, the very region to where the Monarchs return every year! 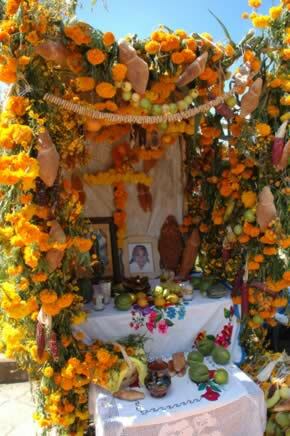 There is a beautiful ofrenda at the Peabody Museum, which is where I learned about the “Harvester” butterfly. The altar is part of the Museum’s permanent collection and is on display year round. Here is a link to the exhibit. This entry was posted in Dia de los Muertos, Monarch Butterfly and tagged Day of The Dead, Day of the Dead altar, Dia de los Muertos, Dia de Muertos, Harvester Butterfly, marigolds, Monarch butterfly, Ofrenda de Muertos, Purepecha on October 29, 2016 by Kim Smith.